I have seen this very large bird a couple of times in recent days (April 21 2014). It is over two feet tall and its wing span is enormous!! We have hawks in the area and it is much larger. 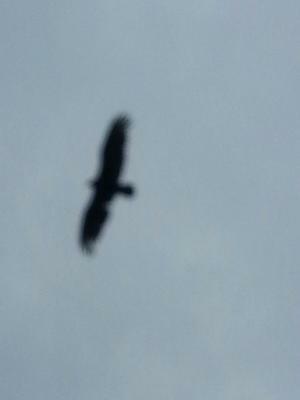 The best I can make of it is a Golden Eagle. 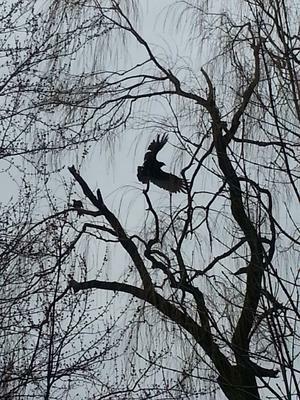 UPDATE: Here is another picture of the large bird that has been around Applewood, Mississauga, the past week (April 21 2014). It does not have a white head, so don't think it could be a Bald Eagle, much larger than the resident hawks in the area. Did not see clear signs of white in wings so do not know if it is a Turkey Vulture. Thanks for the update and new picture, Andy. Hmmm.... I'm not sure but a bird that size could be a Turkey Vulture if is is black & white under it's wings, and if it "wobbles" when it flies. If it has a white head and tail it will be a Bald Eagle, and if it doesn't have the white head and tail it might be a juvenile Bald Eagle. I'm not sure how likely it is to be a Golden, but perhaps one of our readers will know. Thank you for writing to us and telling us about your sighting. Saw an amazing bird of prey yesterday on Stavebank Rd, Port Credit. As it perched on top of a very tall spruce tree, it was calling with a very unique sound and waiting for a response. With binoculars I could see it has a white chest and tan/buff feathers on head and back. There did not appear to be any black and no speckling of colours was visible. Perhaps it was a younger adolescent? Still very large with close to a 4 foot wing span. No wobbling while it flew. Not an ugly head like a turkey vulture but still cannot identify what it was. I just saw the same bird in St.Catharines Ontario. I have no idea what this bird is but it is solid black and the wing span is massive. Four smaller birds were chasing it a way. It also had a call that was very distinct. I see dozens of these north of Hwy 7 in Peel and York Region as well as in Simcoe and Dufferin County. Though we have many Turkey Vultures up here and these birds are of comparable size, there is no note of a red head consistent with the Turkey Vulture. With the Turkey Vulture, one with a keen eye, can note the redness of the head. These birds seem to have a black or very dark brown head. They could be younger Bald Eagles or younger Golden Eagles. They are all black or dark brown in colour. I have yet to see one roost or perch. Hard to tell when they are in flight and you can only see the underside. Magnificent birds and they enjoy riding the thermals in flight as do most raptors. Sure looks like a big beautiful Turkey Vulture. You're right, their wing span is quite enormous! May have seen the same bird on May 29th in Agincourt. Several students saw it and thought it was bigger than the regular hawks. It did not wobble and had long wide wings. It was a brown colour. I came upon this site trying to figure out what this same bird is. It is massive - double the size of a Red Tailed Hawk. It was in our neighborhood, Toronto Beaches, today (May 20). Had all the starlings quite upset and was forced to fly on before I got a chance to take a photo. Definitely did not wobble when flying and there was no markings of a white head or white under the wings. Okay, lets home one of our knowledgeable readers will know what this might be!